I used to be a loner artist type, obsessed by the arts and misunderstood by many. I left home at 15 years old. My name is Heather King, I'm 38 and I have Lyme disease. I moved to Ottawa in 2008 and fell in love with the city's alternative scene, nature, parks and an exciting lifestyle. In 2009 my photography started to take off, and I had showings and an art gallery opening. vacate the venue quite early with all of my art still up on the walls. Little did I know I would find my 'other half' because of this event. She suffered from anxiety as well. On her way out of the venue, she saw my photography. Time stood still as she gazed upon my work unable to speak. From that night on, we have become inseperable. We went to concerts, clubs, hiked and walked. I had a gym membership and worked full time transcribing medical files, typing 8 hours every day. I was full of life and energy. as it would cause a lot of pain. After many emergency visits from chest pain, palpations, neck pain, numbness and tingling in fingers, they did an MRI. It was discovered I had herniated discs in my neck. I saw a neurosurgeon in Ottawa who told me he wouldn't help until I lost control of my bladder and bowels. The family doctor at the time put me on heavy duty medications. I was so drugged up I would walk into walls and at times hallucinate. In 2010, still getting nowhere, we found a top-notch neurosurgeon in Montreal who agreed to see me once a year. With several tests, nerve conductivity, physical exams, she was baffled by my symptoms. She knew my symptoms did NOT fit with herniated discs. She told me I most likely I had 'some sort of a disease'. In the summer of 2010 my left hand was sore and I couldn't move my fingers. The next day it was swollen the size of a catcher's mitt. The hospital had me hooked up to silver bags of IV medication, told me it was some sort of 'infection' and sent me home with a fanny pack which adminstered bags of IV antibiotics into my system every 8 hrs for a week. Still no diagnosis. I continued to become more ill, increasingly terrifying symptoms, and so very weak. I could no longer ride in a car, and had to ride the handicap bus. I was a prisoner in mind and body. I felt as if I was losing brain cells, growing 'stupid' daily as I would forget words, sentences, what I was saying, my address, moments and places in time. My physical body was betraying me as I could no longer fit into my clothing, I was bloated, everything was swollen, and was told by an ambulance driver that I have pitted edema. Early 2011, my best friend Kristy could no longer handle the mental/physical state I was in. She made it her full time job and mission to research and try to help me. Kristy had gone to EVERY medical appointment with me, every ambulance ride to the hospital, she was my advocate, witness, family and best friend. After months of research, she asked my new family doctor to test for Lyme disease. His automatic response was 'Heather doesn't have lyme disease'. After receiving the results, I was told that my doctor 'didn't understand them', and was sent to my rheumatologist. She refused to see me. Desperate, I contacted CANLYME (Canadian Association for Lyme Disease). They were all too kind to ask for my results and interpret them. I was told with my numerous symptoms, and test results, I had Lyme Disease. Still with this information, no one would believe me or help me. We learned that it is actually illegal for Canadian doctors to treat someone with lyme disease for more than one months time, if they do, they lose their license. I then got a test from IgeneX, which tested positive as well. Once that came back no one could deny the fact, but at the same time no one could help me. CBC News came to my home to do an interview, which you can read HERE. Still no one in my city or my country would help me. I became suicidal. I confessed to my best friend, I could no longer live this way or carry on, as there is no longer a point in going to the hospital or doctor because no one will help me. The next day she started a fundraiser for me on Indiegogo, as we found a Lyme literate Dr in the USA who could help me. The best part of the terrifying journey, is the enormous amount of love and support I have found in people I have never met, and those around me. What really heals my heart and gives me hope are all of the prayers, positivity, compassion and friendship, from friends across the world, old and new. I feel like I am the luckiest soul in the world because of Kristy, my best friend, and so many others. My entire life I have felt shunned, abandoned and neglected until I met her. She has the kindest heart and most gentle soul. She is saving my life with everything she does for me on a daily basis. Photography is my passion, as crucial to me as the air that I breathe. When I started to get really serious about my photography/art, I delved into darkness. I thought at the time I was purging myself, freeing myself from a past full of abuse and neglect. The darker I would create, the more graphic, I assumed the end result would speak to the viewer, telling my story in a million ways but by never uttering a word. I wanted it to be obvious. I was focusing all of my attention on abusive situations which in the end caused a lot of damage to me mentally, emotionally, spiritually and physically. What you focus your attention on, DOES grow. Now I want to create hauntingly beautiful, mystical worlds that are completely original, that come from another time and place. I want to romance the viewer, leave them mystified, constantly asking the question ‘how did she do that’ or ‘I wonder what it’s like to live in her mind’. When I am creating art, I wander and get lost through this beautiful labyrinth in the center of creation. I do not focus on the past, present or future. It is as if I am in this meditative or mystical state, in another world of what I am creating. Focusing on the positive is the ONLY way I believe a Lymie can survive. Being mindful and grateful goes a long way living with this terrifying disease. In 2011, I fell madly in love with Snowy Owls. They became the centre of my universe. After doing much research, talking to local area photographers, and some serious door-to-door canvasing from friends, we were able to locate the most magical Snowy Owl of all. I named her Momma Goddess. We would drive an hour out of town, and I would spend weekends sitting on orthopedic pillows watching and trying to photograph this hauntingly beautiful creature in a farmer's field. It was when the other photographers left that I would get some real quailty time. She would come so close to me and linger. I would talk to her, tell her how beautiful she was. The moments I was able to spend time with her, there simply was no past, no present, I didn't recognized my seering daily pain. I felt such a peace and fascination within, it was the ultimate high, the most beautiful and overwhelming experience of my life. I found the closest version to her in a stuffed animal puppet and I carry her with me to every medical appointment and hold her close to my heart when I sleep. She is the family and the love and the support I have always wanted. All the photos you see here are for sale, and there is much more to see on her photography website, YouTube, and other sites. You can ~ Contact, watch, and view her work ~ She would love to hear from all of you! 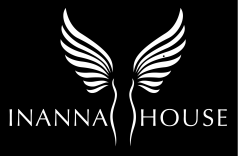 Click on the Twitter icon to tweet about Inanna House, Artist of the Month, and Heather ~ The more awareness the better!